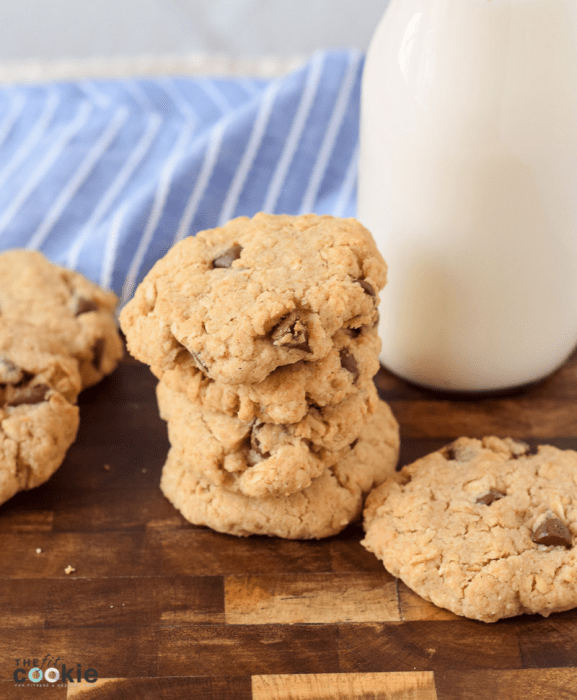 Our version of the classic (and one of my favorite cookies) Oatmeal Chocolate Chip Cookies. These ones are gluten free, dairy free, and peanut free! Cooler fall days are the perfect time for lots of baking, especially on the weekend. The weather here has gotten pretty chilly quickly: there’s snow in the forecast tomorrow, and there is already quite a bit of snow in the mountains. 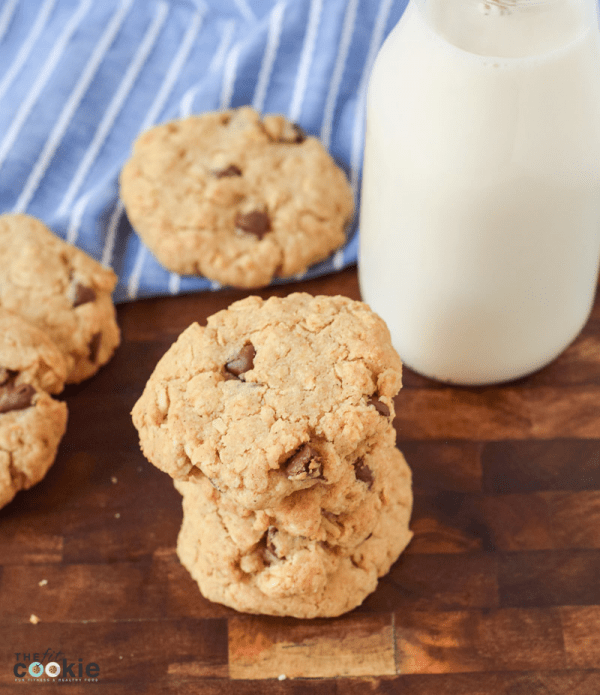 The cold comes early here, and those chilly days are just begging for baked treats like these Oatmeal Chocolate Chip Cookies. 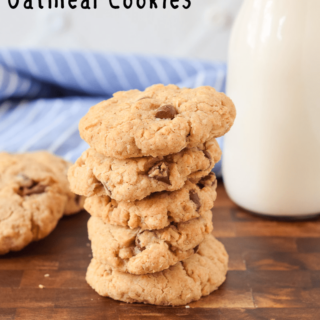 It’s been on my to-do list to remake some of my older recipes, and I couldn’t wait to create a new recipe of my older Chocolate Chip Oat Cookies recipe (if you click over to that post, ignore the dreadful photos). 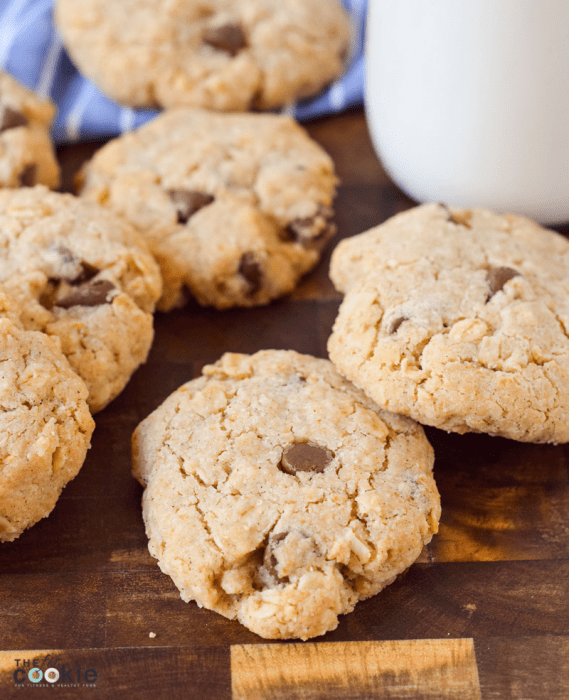 Instead of revamping the old post, I just created a completely new recipe for these Gluten Free Oatmeal Chocolate Chip Cookies. 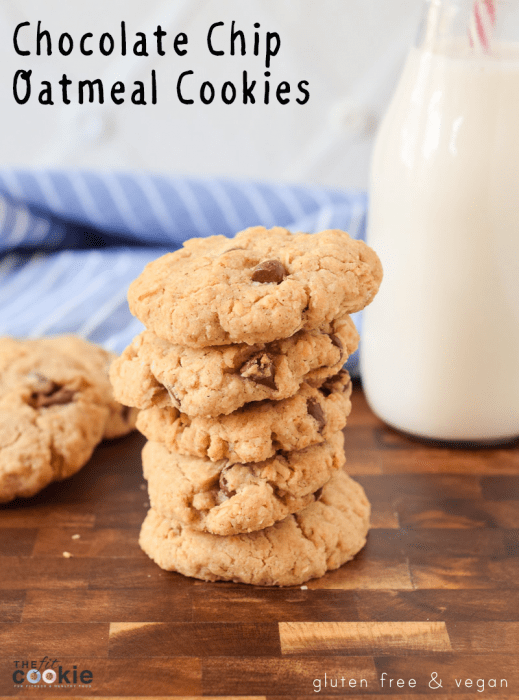 These cookies are a variation of the delicious Apple Oatmeal Cookies I just posted recently, which are perfect for fall! I was even working on a version of these chocolate chip cookies with some dairy free Cocomel caramel tucked inside. I’ll have to keep working on that recipe because they were so good. I’ll just have to hunt down (or make my own) caramel that’s nut-allergy friendly since Cocomels are made in a facility with nuts so my kids can’t have them. Making my own recipe for dairy free caramels and dairy free toffee has been on my to-make recipe list for a while now. I’ve come close to creating what I want, but not quite there yet. I’m planning (crossing my fingers) that this Christmas I’ll be able to get a final recipe nailed down to share! Preheat oven to 375 degrees and line a cookie sheet with parchment paper or set out a cooking stone. In a medium bowl, stir together the dry ingredients (oats, flour, ground flaxseed, baking powder, salt, and cinnamon). Set aside. In a separate medium sized bow, cream together the wet ingredients: coconut oil (you’ll want this soft not melted), sugar, maple syrup, and vanilla extract. Add the dry ingredients to the wet ingredients, along with the non-dairy milk and chocolate chips, and mix until a dough forms. Take about 1 Tablespoon cookie dough and roll into balls and flatten slightly, then set it on your prepared cookie sheet about 1 inch apart. Bake for 15 minutes or until a bit golden around the edges. I like my cookies slightly undercooked and soft in the middle, so this was perfect. Allow to cool for about 10 minutes before eating (they can be crumbly until they’ve cooled off a bit).